Right from the moment he came into the limelight until his death, Man Ray did not allow much of his early life to be known, even denying that he once had another name other than Ray. Man Ray was born to Jewish immigrants from Russia. He was the only child before his family was blessed with another son and 2 daughters, the youngest child was born shortly after they relocated to Brooklyn in 1897. Man Ray's family changed their surname to Ray in 1912. Ray was nicknamed Manny but changed his name to Man, and slowly started to use Man Ray. Ray's father worked in a garment factory. He also owned a small tailoring shop outside his home, enlisting all his children from a tender age. Ray's mother, who was very passionate about tailoring, enjoyed making and designing her family's clothes. She used to make clothes from her own designs and create patchwork items out of scraps of fabrics. While Man Ray didn't want to associate himself with his family's background, this experience did leave a mark on his art work. A number of clothing and sewing related items appear at every phase of his work and in nearly every medium. Ray's artistic and mechanical ability came out at a tender age. His high school education played a more important role in providing him with a firm grounding in drafting as well as other art techniques. He also educated himself with regular visits to art museums, where he learnt the works of Old Masters like ike Leonardo da Vinci, El Greco, Francisco Goya, and Caravaggio. As a student, Ray was inspired by Mr. Alfred Stieglitz, whose gallery he toured regularly, as well as Mr. Robert Henri, who was his high school teacher. At age 25, Ray had his very first one-man painting fair. His friendship with Duchamp, which spanned for 55 years, influenced their work and resulted in joint creative endeavors. Soon after graduating from high school in 1908, Ray was offered a scholarship to study architecture but decided to pursue a career in arts. While his parents were unhappy with his decision, they supported his love for the arts, and even rearranged the modest living quarters of the family so that their son could employ the room as his studio. Ray stayed for 4 years working towards being a professional painter, while also earning some cash as a technical illustrator and commercial artist at various Manhattan companies. Initially, Ray was inspired by cubism and expressionism. But when he met Marcel Duchamp, he started to add some movement to his works. His focus then changed to Dadaism. Dadaism challenged the then perceptions of art and literature, and advocated for spontaneity. Together with Duchamp and Francis Picabia, Man Ray became the leading figure in Dada movement. In 1920s, influenced by the writings of psychologist Sigmund Freud, the literary, intellectual, and artistic movement called Surrealism sought a revolution against the constraints of the rational mind; and by extension, they saw the rules of a society as oppressive. Surrealism also embraces a Marxist ideology that demands an orthodox approach to history as a product of the material interaction of collective interests, and many renown Surrealism artists later on became 20th century Counterculture symbols such as Marxist Che Guevara. Man Ray was the only member of Paris surrealist movement from the US. Among his popular artistic works at that time was The Gift, the sculpture which had two found objects. Encouraged by Marcel Duchamp, Ray relocated to Paris in 1921. With the exception of a decade in Hollywood during WW1, he spent the whole of his life in France. During his time in France, Ray continued to be part of artistic avant garde, coming into contact with renowned figures such as Ernest Hemingway and Gertrude Stein. 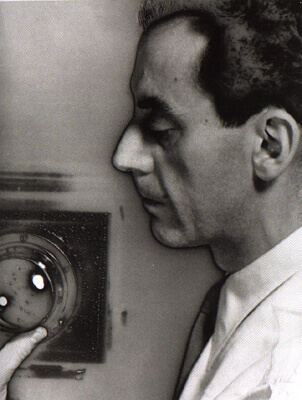 Man Ray started working in several mediums including sculpture, painting, film, and photography. His earliest artistic works w ere relatively static, influenced mostly by cubism and expressionism. Ray Man became popular for the representations of his artistic works. He went on to develop a career as a fashion photographer, capturing images for popular magazines in Paris. While in France, he produced brilliant art works which are today known as Rayogrammes - images created on a piece of photographic paper without a camera; the subject is placed directly on a piece of paper, light is exposed then the image is produced. The shadow of the object is what produces the image, which emphasizes the influence of the light and shadow instead of the importance of the picture itself. Another popular work from this period was Violin d'Ingres in 1924. This photograph featured the naked back of his lover, an actor known as Kiki, styled after the painting by a French artist called Jean August Dominique. In a witty twist, Man Ray drew two black shapes on her back to make it appear like musical instruments. Ray made a number of short films between 1923 and 1929, creating classic Surrealistic works like L'Etoile de Mer, Emak Bakia, as well as Les Mysteres du chateau de. He also experimented with the method known as the Sabatier effect, which adds a silvery quality to the picture. In 1940, Ray fled the war in France and moved to Los Angeles to continue his art. He lived in L.A from 1940 to 1951. A few days after arriving, he met and started to date Juliet Browner. They tied the knot after 5 years of courting in a distinctive triple wedding with Dorothea Tanning and Max Ernst. While Ray was a very successful photographer in New York and Hollywood, he returned to France in 1951. There, he continued to focus on his paintings. He published his autobiography titled 'Self-Portrait' in 1963. In his final years, Ray continued his finest art works, with exhibits in London, New York, Paris and other popular cities before his death. He died in his studio in his beloved city of Paris on November 18, 1976. He was 86 years of age. His works can be found in a number of museums around the globe, and to date he is remembered by many for his artistic humor and uniqueness.